by Briana Thornton on January 3, 2019 . Want a new way to deliver content to customers and prospects? Amazon’s Alexa may be just the tool to help you grow your business with one of her many features: Flash Briefings. The Amazon Echo and Dot are voice-activated devices that can perform a multitude of tasks by giving them simple voice commands. Saying, “Alexa, play my Flash Briefing” triggers a short news or information update that you, the listener, can customize from thousands of content options. Each “skill” can be up to 10 minutes long (although that is not recommended) and on a host of topics including tips, industry news, inspirational quotes, professional insights, whatever have you. Think of it like a custom playlist for your favorite short podcasts. Pretty great, right? Alexa: Amazon’s virtual voice assistant. She answers all your questions, plays the music you request, gives you your Flash Briefing, essentially anything you ask her, she will give you an informed answer. Skill: Kind of like the apps on your smartphone, Alexa has different skills that each customer can personalize. Some examples of available skills include trivia, cooking, weather, traffic, and news. Flash Briefing: A succession of quick, personalized overviews of news and other content including business or financial advice, music, podcasts, sports, etc. You pick them personally on your app and they’ll be ready for you every morning. Flash Briefing Skill: This is a more specific type of skill. It can be broken down into smaller categories of course (the topic of your flash briefing). One of the most commonly asked questions associated with creating a flash briefing is: “How frequently should I publish content?” Well, here’s the thing, Amazon asks you this exact question when you are setting up your Alexa Briefing and provides you with three options: weekly, daily, and hourly. So while, yes, you have some options here, we strongly recommend publishing daily. This is the way we’ve chosen to grow our own Flash Briefing and podcasts which you can check out here. But, if you think that daily might be a bit more than you can handle, just dedicate yourself to publishing high-quality content at least once a week. People engaging with Alexa want brevity; they’re not taking significant portions of their day to listen to her (or you) ramble on. While Amazon allows Flash Briefings to be up to 10 minutes long, keeping it under two minutes ensures that your listeners aren’t getting bored and skipping through. This is especially critical if you have made it your goal to post daily. Our CEO Erik Olson, the host of the Journey to $100 Million daily Flash Briefing, will brainstorm a series of ideas and record them all in one sitting. This is a technique called batching and it’s a great method of increasing productivity because you aren’t losing time switching between tasks. Mornings are the key to getting your Flash Briefing to the most listeners because that’s when most people are listening as they go about their morning routine. The optimal time to publish is 4 AM ET and if you can’t bring yourself to get up that early and publish manually every day (totally understandable), there are tools to automate them. Try Effct, SoundUp, or Invocable. If you’re working with an RSS feed platform, you should be able to schedule out your episodes well ahead of time. 100% recommended. Just like you do with your website, Pinterest, and other mediums where you promote your business, you want to take advantage of every field by maximizing SEO. Give your Flash Briefing a short, clear name that tells users what it is and contains at least one important search term. Amazon allows you to select up to 30 single words as descriptive keywords. These and your description are prime real estate for your podcast. Include words that people search for related to your content or industry. Share your Skill with your social network by alerting them of its very existence on social media. Maybe 1-2 times per week add these posts to your posting schedules on Facebook, Twitter, LinkedIn, Instagram, Google Plus, even Pinterest. Entice them with teasers to create curiosity and provide clear instructions on how to access your Skill. Write a social media post, send an email to your subscribers, add a link to your email signature, and include a link on your social profiles. If you have an existing podcast, take the best, most concise content from each episode and split it into 1-3 minute segments to post over a week or two. Try conducting interviews with industry specialists. Ask a couple of questions and get their insight for your listeners. Flash Briefing content can be recorded audio or text-to-speech, which is significantly less of a time commitment. Text-to-speech means that you provide Amazon the text you want and Alexa will then read it. Subscribe to industry publications and use that for content ideas to cover in your Flash Briefing. Repurpose your old content. Maybe you have blog posts that you can refurbish for your Skill. The key here is to not use time-sensitive content and to pull from the pieces that performed the best on your website to make sure it resonates with listeners. Tease new content. 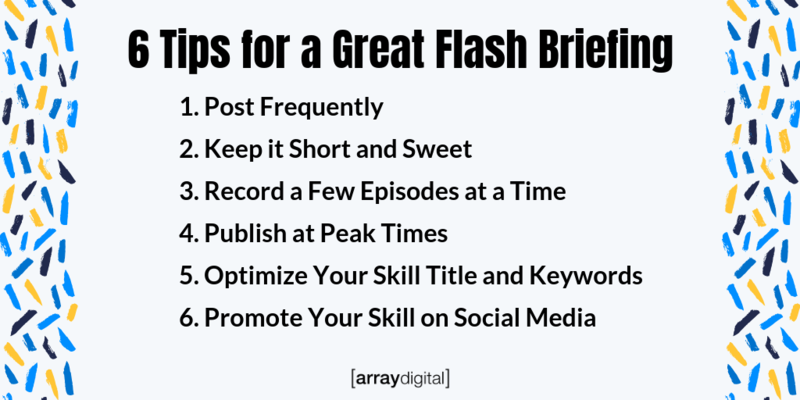 Whether it be new products, services, or blog posts, you can share it in Flash Briefing format. Give a teaser then at the end tell your audience where to find more content on your blog, podcast, etc. So, How Can Alexa Grow My Business? According to the most recent data, an estimated 57.8 million people own an Alexa device. Add to that the number of people that have downloaded the Alexa app, which doesn’t require the purchase of an Amazon product, and that is a ton of visibility you could get on your Flash Briefing. Because Flash Briefings are short, they require less time to produce, which equates to a lower overall production cost. That gives you time to invest elsewhere or publish them more often. Simply put, due to the large audience that your flash briefing could potentially reach, it can yield a greater ROI than other advertising methods. It’s safe to say that voice interactions are a way of the future. Even though the audience for Flash Briefings isn’t huge now (primarily because it hasn’t been largely advertised by Amazon), it’s popularity is set to skyrocket, similar to that of podcasts. When that time comes and you already have an established Flash Briefing, you’ll be poised for success.